10 people were arrested in Moscow earlier this year on fabricated extremism charges. Vyacheslav Kryukov is one of them — and is now on Day 16 of a hunger strike. Vyacheslav Kryukov (centre). Source: Dozhd. Vyacheslav Kryukov, a 20-year-old student at the Russian Academy of Justice, is on hunger strike. 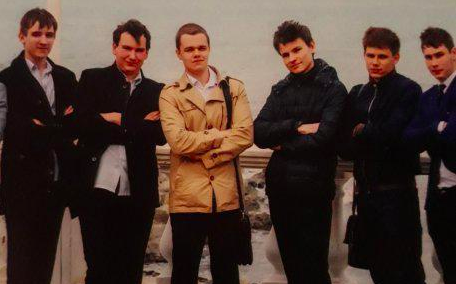 In March 2018, Kryukov was arrested on extremism charges along with nine other people as part of the “New Greatness” case — a previously unknown political organisation based in Moscow. According to OVD-Info, which monitors politically motivated arrests in Russia, FSB officers organised “New Greatness” from the inside — providing funds, stimulus, direction, a meeting space and even training several participants how to use Molotov cocktails. The Russian security services subsequently declared “New Greatness” an extremist organisation, and detained 10 members in a special operation. Kryukov has been held in Moscow Pre-Trial Detention Centre No.3 since March. On 11 September, a Moscow court extended Kryukov’s arrest once again, and he decided to announce a hunger strike as a result. This diary was passed to OVD-Info by Kryukov’s solicitor, Dmitry Ivanov. After I announced the strike, I came back, didn’t eat anything and went to sleep. I woke up, a prison officer summoned me at the morning inspection. We spoke for a long time, he tried to convince me to stop the hunger strike, but in the end we came to a compromise and I wrote him an official statement addressed to the director of the prison. It was quiet for the rest of the day, I was worried about whether they might start applying unlawful methods to me, but thankfully everything turned out OK. I was transferred to a single cell, after a personal conversation with the prison management. The conditions in this cell are actually quite good. I unpacked my things and went to sleep. I had practically no appetite in the morning. At the inspection, I confirmed when they asked me whether I was continuing down this road. My head hurt a little, but they refused to issue me painkillers, because I might get an ulcer as a result. Every time I got up, my head started spinning and my eyes went dark. By evening I felt nauseous, my mouth and throat felt sour. A general feeling of weakness in my whole body. Every time I get out of bed it’s difficult, my legs hurt, and there’s a strange sense that there’s just some kind of spirit-like liquid in my mouth and stomach. Members of the Public Monitoring Commission [an official prison watchdog] came to visit, they asked about my well-being, whether I was drinking water, what day I started the hunger strike on and so on. On the whole, they suggested that I stop what I’d started, that it was pointless continuing, that I’d already attracted attention, that I will only harm my health, that I should, instead, eat and gain strength so I can write various statements. I replied that I no longer wish to put up with all of this, this is why I was forced to do this, that I will inform society about my health and everything that happens to me constantly, that I will write to various institutions, doing everything possible. It’s very cold, I have constant heartburn now. There’s constant and unremitting pain in my legs, my throat feels like it’s being pressed. When I breath out through my nose, there’s a some sort of specific smell of liquid spirit. There’s a constant pulsing around my stomach, it’s hard to stand up and I constantly want to sleep. At the morning medical inspection, after measuring my blood pressure and pulse, they said that I had tachycardia, my weight is 57 kilogrammes. I have very strong heartburn. For a long time I couldn’t go to sleep because of the pain in my stomach and how strong my heart was beating. In the morning it was slightly better, if you don’t count the constant and painful heartburn at times, as well as the difficult in standing up. After midday, they tortured me with trips around the detention centre, although every step is difficult, and I bent over at times, I really wanted to drink. First, they took me downstairs to see my lawyer, then they took me to the doctor, where they weighed me, measured my blood pressure and pulse. Then they took me to see members of the Public Monitoring Commission who wanted to know about my condition, then there was a body search, and only then they took me back up to the single cell, where I fell powerless onto the bench. I feel better, especially if I don’t have to get up from bed for nothing. On the advice of the Public Monitoring Commission members who visited me yesterday, I decided to drink some tea, but the tea they brought in the morning was so strong, it was impossible to drink. They refused to give me any sugar. One of the guards even said that if I’m not coming off the hunger strike, water is the only thing I can drink. The whole day was quiet, there wasn’t even an evening inspection, and I slept with the bright overhead light on. I’m feeling slightly worse today, sometimes I get pains in my chest, it’s hard to breath in deeply. The prison guards are trying to convince me to stop in all sorts of stupid and ridiculous ways, it seems they think I’m an idiot. They refused to give me a newspaper that the Public Monitoring Commission had left me, saying that it was categorically forbidden, and I have the right to newspapers through the detention centre. My blood pressure is 90/60, with a quickened heart rate. My throat really hurts today, it’s hard to drink water. It’s becoming harder to think, my mind is becoming more scattered and less coherent. It feels like something is really pressing on my chest. My teeth hurt. An unusual burst of energy and strength this morning. I woke up several times overnight for unknown reasons and I couldn’t go back to sleep for a long time. My dreams aren’t the most hopeful. Something hurts between my ribs, my throat is very painful. I get chills from the cold from time to time. I’ve been told I can drink tea with sugar and other drinks without coming off the hunger strike, but I haven’t tried this yet. On the whole, everyone is trying to get me to stop. A strong sense of hunger, my teeth hurt. My head spins if I stand up too fast. I was a bit worried the whole day, they’d been trying to scare me before that today (after 10 days) I would undergo a terrible force-feeding procedure or they’d give me a drip. But in the end nothing happened. There was no evening inspection for some reason, and so the bright light was left on all night. This morning they brought me tea, which was cold and very strong, and which was impossible to drink. It seems like my teeth are going weak on the inside. My appetite has almost completely gone, there’s a dry feeling in my throat and mouth the whole time. This morning they gave cold and unbearably strong tea, which I drank at once. It’s getting colder and colder in the cell every day, and I don’t have so many warm things. I feel fatigued, every hour I want to sleep. This evening they brought a big bunch of papers, which turned out to be dozens of letters – I couldn’t believe they were all for me. Thank you to all the people across the country for the support. All your messages are touching and give me strength in this difficult time.